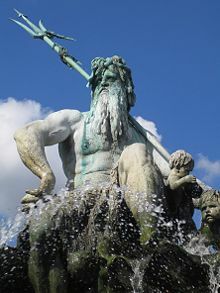 In Greek mythology, Poseidon (Greek: Ποσειδών; Latin: Neptūnus) was the god of both the sea and earthquakes. In sculpture, he was instantly recognizable by his three-pronged spear (the trident) that he held in his hand. When the Roman Empire invaded Greece, Poseidon was worshiped by the Romans as the sea god Neptune. In his benign aspect, Poseidon was believed to create new islands, calm seas and protect travelers. However, when offended or ignored, he struck the ground with his trident and caused chaotic springs, earthquakes, drownings and shipwrecks. Despite this somewhat frightening persona, Poseidon was widely worshipped by sailors as their patron, and they would pray to the "Sea God" for a safe voyage, sometimes drowning horses as a sacrifice to the god. As with many Greek deities, Poseidon was depicted as a lascivious figure who took women (both divine and human) by force if they refused his advances. His mythological children included Triton, the merman; Pegasus, the winged horse; Polyphemus, the Cyclops; Oto and Ephialtae, the giants; and Arion (the talking horse). Poseidon was a major civic god of several Greek cities: in Athens, he was second only to Athena in importance; while in Corinth and many cities of Magna Graecia, he was the chief god of the polis. It is also said that Poseidon was one of the caretakers of the Oracle at Delphi before the Olympian Apollo became its patron. Indeed, Apollo and Poseidon worked closely in many realms: in colonization, for example, Apollo provided the authorization to go out and settle from Delphi, while Poseidon watched over the colonists on their way, and provided the lustral water for the foundation-sacrifice. Further, Xenophon's Anabasis describes a group of Spartan soldiers singing to a paean to Poseidon—a type of hymn normally reserved for Apollo. Poseidon is already identified as "Earth-Shaker" in Mycenaean Knossos, a powerful attribution in a society where earthquakes were credited with the collapse of the Minoan palace-culture. In the heavily sea-dependent Mycenean culture, no connection between Poseidon and the sea has yet surfaced; among the Olympians, it was determined by lot that he should rule over the sea. In other words, the god preceded his realm. In ancient Greece, the feast day in his honor was widely celebrated at the beginning of the winter. On a larger scale, "there was a festival once every fifth year at Sunium in honor of Poseidon - evidently, then, a major event. Also, animal offerings to Poseidon were a common feature at the feast days of other gods, including the "festival at the temple of Hera on the 27th of Gamelion," which honored the goddess "together with Zeus the Accomplisher, Kourotrophos and Poseidon." Poseidon was a son of Cronus and Rhea. In most accounts, he is swallowed by Cronus at birth. However in some versions of the story, he, like his brother Zeus, did not share the fate of his other brother and sisters who were eaten by Cronos. He was saved by his mother Rhea who tricked Cronus into eating a foal instead, saying that she had given birth to a horse. Zeus and his brothers and sisters, along with the Hecatonchires, Gigantes and Cyclopes overthrew Cronus and the other Titans. According to other variants, Poseidon was raised by the Telchines on Rhodes, just as Zeus was raised by the Korybantes on Crete. When the world was divided in three, Zeus received the sky, Hades the underworld and Poseidon the sea. The hymn to Poseidon included among the Homeric Hymns is a brief invocation, a seven-line introduction that addresses the god as both "mover of the earth and barren sea, god of the deep who is also lord of Helicon and wide Aegae, and identifies his twofold nature as an Olympian: "a tamer of horses and a saviour of ships." In another tale, Athena and Poseidon compete for the favor of the Athenian people, with each god promising total sovereignty to the victor. The terms of their contest were simple: whoever could provide the citizens of Athens with a more valuable gift would become their official patron. Poseidon offered the first gift—striking the ground with his trident and producing a spring. Unfortunately, the water was salty (perhaps due to his oceanic provenance) and was not terribly potable. Athena, on the other hand, offered them an olive tree. Seeing both options, the Athenians (as represented by their king, Cecrops) accepted the olive tree and along with it Athena as their patron, as her gift provided them wood, oil and food. Given that at its height Athens was a significant sea power, it seems reasonable to assume (following some scholars) that this tale represents a clash between the value systems of the early Mycenaeans and newer immigrants. You have no sense, and forget how we two alone of all the gods fared hardly round about Ilius when we came from Jove's [Zeus's] house and worked for Laomedon a whole year at a stated wage and he gave us his orders. I built the Trojans the wall about their city, so wide and fair that it might be impregnable, while you, Phoebus [Apollo], herded cattle for him in the dales of many valleyed Ida. When, however, the glad hours brought round the time of payment, mighty Laomedon robbed us of all our hire and sent us off with nothing but abuse. He threatened to bind us hand and foot and sell us over into some distant island. He tried, moreover, to cut off the ears of both of us, so we went away in a rage, furious about the payment he had promised us, and yet withheld; in spite of all this, you are now showing favour to his people, and will not join us in compassing the utter ruin of the proud Trojans with their wives and children. 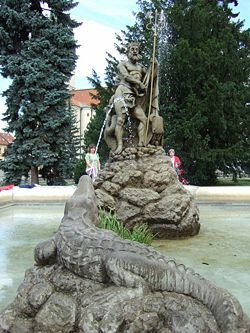 To avenge his mistreatment, Poseidon proceeded to send a sea monster to attack Troy in the years before the Trojan War. Despite this bias, the sea god does rescue Aeneas from the Greeks after the Trojan prince is laid low by Achilles. In the Odyssey, Poseidon is a constant adversary to the titular hero, as he seeks revenge for the blinding of his son Polyphemus by the crafty mortal. Given that the bulk of Odysseus's return voyage was by sea, it was easily achievable for the enraged deity to delay the hero's homecoming to Ithaca by many years. ↑ Micha F. Lindemans, "Neptune" in Encyclopedia Mythica. Retrieved April 23, 2007. ↑ Farnell (Vol. IV), 16. ↑ N. S. Gill, Mates and Children of Poseidon, About.com. Retrieved April 22, 2007. ↑ Dillon, 131, 138-139; Mikalson, 70-71, 170, 174. ↑ Dillon, 30, 32, 36. ↑ Ventris and Chadwick, 463 (Document #172 (from Pylos)). ↑ The ancient palace-city that was replaced by Vergina. ↑ The Homeric Hymns (XXII), Translated by Hugh G. Evelyn-White, available online at Sacred-Texts.com. Retrieved April 22, 2007. ↑ This would explain the discrepancy between Poseidon as "principal god of the Mycenaean pantheon" (Rutkowski, 209) and his status as a relatively uncommon figure in extant Greek mythology (Gantz, 63). 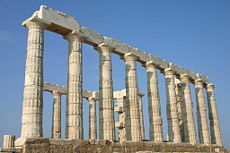 ↑ Homer, Iliad Book XXI, translated by Samuel Butler, available online at Sacred-Texts.com. Retrieved June 15, 2007. ↑ Homer, The Odyssey IX; Euripides, The Cyclops. See also: Rose, 244. Farnell, Lewis Richard. The Cults of the Greek States (in Five Volumes). Oxford: Clarendon Press, 1907. Robertson, Noel. "Poseidon's Festival at the Winter Solstice." The Classical Quarterly (New Series), 34.1 (1984). pp. 1-16.